We want copying and pasting content within Google Docs to just work. So, today we’re launching a new web clipboard that improves copy and paste in Google Docs. This new clipboard temporarily stores items you’ve copied in the cloud, then allows you to paste them with proper formatting into other Google Docs. 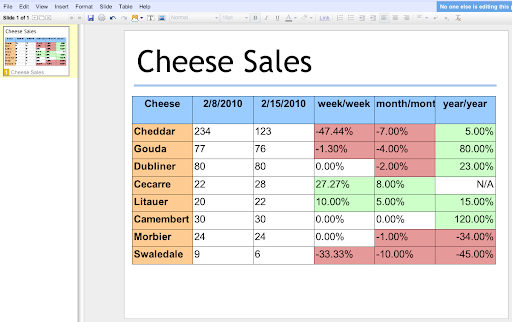 Say you work for a cheese company and you've created a table in a Google spreadsheet summarizing cheese sales. You want to present the results to your coworkers using a Google presentation. Now, you can just select your cells in the spreadsheet and copy them using the new clipboard menu. In your presentation, select the cells from the web clipboard menu to paste. Your spreadsheets table will now be in your presentation. It works just as you would expect. The new web clipboard lets you copy content between documents, spreadsheets and presentations more easily and with improved fidelity, and this is just our first step. Note that while items in your web clipboard are available across browsers and across sessions, they do expire after a month. We hope you find these changes useful, but please let us know how you think we can improve interaction between Google Docs on our forum.